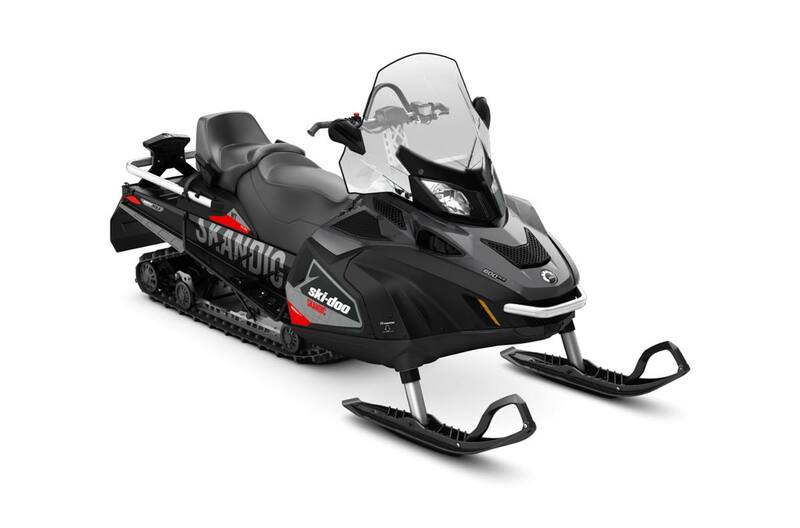 Designed from the start as a work sled, the Skandic WT snowmobile delivers exceptional off-trail performance, fuel efficiency, capability and towing capacity. Finger throttle position (600 & 900 ACE): Throttle block can be rotated to be used as either a traditional thumb throttle or unique finger throttle. SC™-5U articulating rear suspension: Features settings that maximize deep snow traction in reverse or lock out for towing. Synchromesh transmission with reverse (2-1-N-R): Take off from a stop smoothly, even with a heavy load, thanks to two forward and one reverse gears. Inline 2-1-N-R pattern on right side and can be safely shifted while on the fly. 2-up seat with passenger handholds: Comfortable 2-up seat with backrest, including handholds. Vehicle overall length: 3,240 mm / 127.5 in. Vehicle overall width: 1,076mm / 42.4 in. Vehicle overall height: 1,330 mm / 52.3 in. Ski stance: 900 mm / 35.4 in. Track nominal width: 508 mm / 20 in. Track profile height: 38.1 mm / 1.5 in. Front suspension max. travel: 150 mm / 6 in. Windshield: 580 mm / 23 in.